There are lots of great campsites in Washington State where you can enjoy a variety of outdoor activities. If you have never camped in Washington before, you are in for a treat. So pack your gear and get ready for an adventure. Standard fees for campsites in Washington state parks range from $17 to $22 and include nearby water and flush comfort station. Utility campsites run from $23 to $31 and have the same amenities as standard sites but also include electric. They may include water and sewer. Primitive sites are just that-primitive. That means no flush station so make sure you come prepared. Battle Ground Lake offers year round camping on its 280 wooded acres near the foothills of the Cascade Mountains. This is a great place for hiking and horseback riding as well as water activities like fishing, swimming and boating. Camano Island is 134 acres surrounded by majestic mountains and bordered by 6700 feet of shoreline. Another year-round campground where you can enjoy varied activities such as clamming, crabbing, diving, hiking and even golf on the 18-hole course near the park. Campsites are first come, first served. Camping in Washington State isn't just limited to State Parks. Try a National Park for your next trip. Here are two for you to check out. 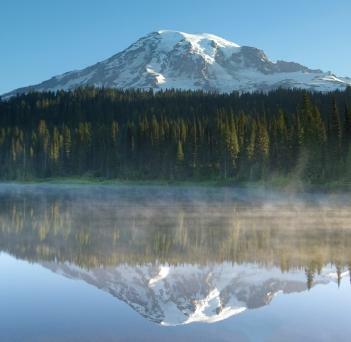 You can't go to Washington without visiting Mount Ranier National Park. Campground fees range from $8 to $15 per night depending on the campsite you choose. For more about individual campsite amenities, visit the campground fees and reservations page. Most are first come, first served with the exception of the Cougar Rock and Ohanapecosh campgrounds where reservations are recommended. Olympic National Park is another must-see if you are visiting the state of Washington. Camp fees here are from $10 to $18. Olympic National park has 16 campgrounds with a total of 910 campsites. All are first come, first served with the exception of Kalaloch which requires online reservations. More information is available on the campgrounds page. Rates range from $21 to $31 per night for two people depending on the individual campground. Many parks offer organized activities, swimming and games so the entire family will find something to enjoy. Ellensburg has year round sites on the Yakima River where you can enjoy rafting or fishing. If you prefer, you can also enjoy hiking the John Wayne Trail. The Seattle/Tacoma KOA has electricity to their tent sites along with free Internet, a heated pool and many planned activities to maximize your family's fun. With so much to see and do, your first camping trip to Washington will not be your last.